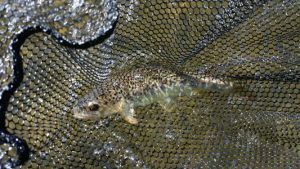 How to get a drag free drift fly fishing is the quickest ways to increase your catch on the stream. This short posts will cover many observations from guiding since the mid-1980’s for trout to assist you in your journey as a fly fisher. Most folks can recognize drag when the indicator or dry fly appears to mimic a water skier pulled behind a boat. The definition page defines drag as the fly moving at a speed other than the current’s speed in which it is traveling. Many new fly fishers recognize drag when it is pulled rapidly by the currents of the water. This was called major drag in early fly fishing literature. There is also micro drag (very subtle) that takes a keen eye to discern on the water. In other words, major drag is very obvious and the micro drag is not so obvious. They both lead to a refusal as far as the fish is concerned. Trout tend to notice in an instant when the fly does not ride in the natural currents like the natural insects. Drag free drifts are a passive method to fish because the patterns move in a natural state. Drag applies to all styles of fly fishing as in wet flies, nymphs, dries, and even streamers. Sure we use active methods like jigging, swinging, pulling, and lifting flies as well when fly fishing but passive methods will take you the longest amount of time to perfect. The leader length greatly impacts what is possible for the passive presentations to occur on the water. It is my opinion that most of the store bought 7 and 9-foot leaders are a joke! I say this because I do not know any fly fishing ninjas globally that use that setup on the water. There are basically two schools of thought in that the short leader setups will require a ton more line control on the stream. I would say the majority of fly fishers go this route because this is what the shops all over the globe keep on the shelves. The long leader setup on a long rod enables you to get closer to perfect drifts every time just by lifting the rod tip high. The dry fly, dry dropper, or whatever you are fishing is in perfect control because there is little to no leader on the water except for the pattern you are fishing. It is stealthy and far easier to teach new anglers how to control drifts 35′ and closer. I prefer a very long leader 24-32′ feet and an 11′-12′ foot rod for controlling the drift. This long leader setup is how I started both of my kids when they were around three years old. The goal then becomes time on the water for extending this long leader set up further away when the water types become technical. The passive methods of attaining a natural drift are more complex for a fly fishers journey to improve. It is solved by a two-step process in that we have the fly cast and line control. There are numerous fly casts for dealing with various water currents. Many of my favorite ones would include many variations of curve casts, slack line casts (puddle, wiggle, and tuck casts). Take a casting lesson and practice these to formulate your casting tactics! This starts a solid foundation for which you can build a lifetime of good habits perfecting these casts on the water. If the foundation remains weak, then the progression is stagnated. Many sports training books repeat the notion that it takes 10,000 repetitions to have trained a motor skill into muscle memory. So it is essential to get in the yard often or on the stream to perfect your casting! It will be one of the best investments you can make in fly fishing! Mending line is the repositioning of the leader (usually opposite the of the water currents). It can be as simple as just lifting the rod high and then lowering the rod back down after the casts. It can also be a repositioning move similar to turning a jump rope. Sweep the rod opposite the current to reposition the leader up current on the fly. Think of this move always the exact opposite of how the currents act on the line. I think it helps to think of mirror image. This simple mirror concept will aid you greatly in the water. You need to reposition the line constantly to cover the water you wish to fish. Usually, folks mend once and wait for something to happen. It takes constant work! It is rarely a single mend once since the water current keeps flowing in all directions! A Stack mend is a valuable tool for distance work on the stream. It is an underpowered roll cast to place the leader usually up current on the fly. A Reach mend is simply moving the rod out to the side to place the line toward the upwards current. It is performed either in the air during the cast or after the cast when the line is already on the water. A Wiggle mend is lifting the rod high and shaking the tip. This move eliminates the line being manipulated by the water currents. Drag and drop the pattern to the location you intend to fish by moving the rod! This is one of the most important line control exercises on the stream and it keeps your fly in the water much longer throughout the day! Especially for new fly fishers that often miss their target by a few feet to a new area. Rather than cast again, drag the pattern where you want it and continue on with line control mending. Lift and reset is another great tactic when working flies downstream from your position. I use this often because it enables me to grid off sections of water in a methodical manner without casting! If I wish to grid off the water below me to cover 24′ of width. I can do this with 24 lift and reset motions by gridding off 1-foot increments. Lift the rod high or even point it up current and lower it back downstream. 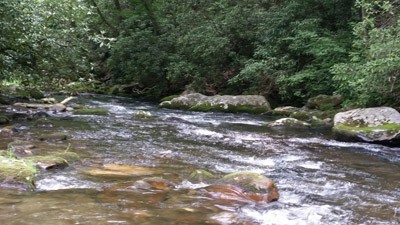 These methods will provide you with plenty of tools for perfecting your drifts on the stream! They are a starting point for developing a mindset of controlled drifts for your next stream visit. 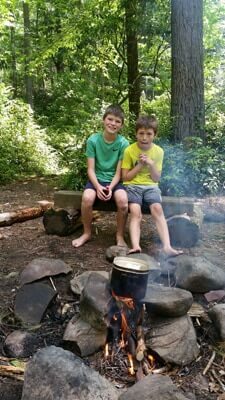 Had a great camping trip with my kids (both boys just turned 8 and 11) the past few days in the Smokies. Duncan and Connor really enjoyed getting out there for their big adventure! How to get a drag free drift fly fishing is one of the grails of the sport. Great dry fly water right next to the campsite gave up a dozen wild browns in the first 30 minutes using these methods. Best of luck perfecting your drift!